The Harrisburg Choral Society is the oldest continuously active music ensemble in South-Central Pennsylvania, and throughout its history, through ups and downs, the group has remained a fixture of the Harrisburg area's cultural landscape. The Society was founded in 1895, under the direction of William Wallace Gilchrist, one of the founders of the Philadelphia Orchestra.The first piece performed was Mendelssohn's Elijah. The Society was briefly reorganized in 1927 as "The May Festival Chorus", annually performing Mozart's "Grand Mass" with nationally-recognized soloists. The chorus was again reorganized in 1937 under its original name, the Harrisburg Choral Society. The Society has maintained its traditional role of performing major works of choral literature with professional soloists and orchestral accompaniment. The Society has also included many of Harrisburg's most influential names as part of its history, including McCormick, Boas, Reily, Calder, and Rutherford. An April 1967 Harrisburg Evening News article remarks: "Its current members include doctors, lawyers, housewives, social workers, ministers, music teachers, engineers, state workers, retired persons and high school and college students. There are no auditions, but prospective members are interviewed by [the director]". In the same article, longtime director Donald Clapper remarked that the purpose of the Society is "the study and enjoyment of great choral music". 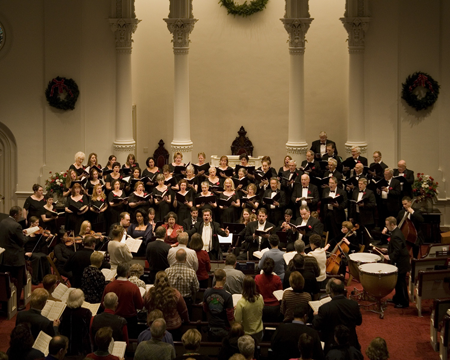 It is notable that throughout its long history, the Harrisburg Choral Society has maintained its core values of community participation in presenting great works of choral music with professional soloists and orchestra, and a membership representing the Harrisburg and South-Central PA community. It was true in 1895, in 1967, and remains true today.